As the Museum of Neon Art works to complete their spectacular new home in Glendale, more and more historic neon signs have been coming back to life all over Southern California. The Downtown Rialto and United Artists Theater marquees were relit by Urban Outfitters and the Ace Hotel earlier this year, and last Tuesday their Broadway neighbor, The Globe, flickered on and began to rotate after decades in the dark. 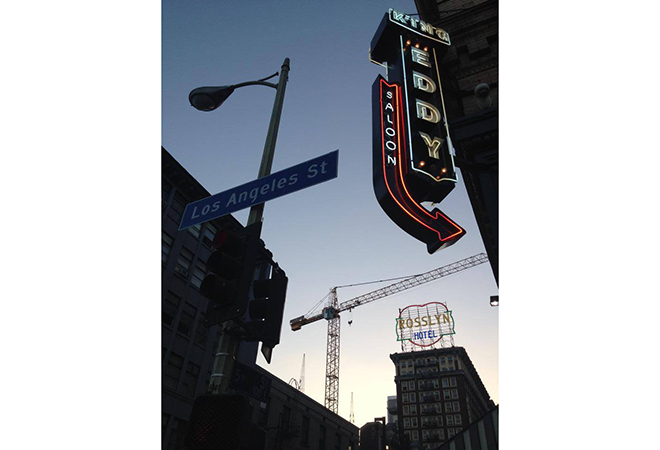 At the same time, the giant Rosslyn Hotel neon heart was spotted blazing atop the century-old hotel at 5th and Main, and the King Eddy Saloon a block away sports a new electric sign that looks like it could have been there when they opened in 1933. 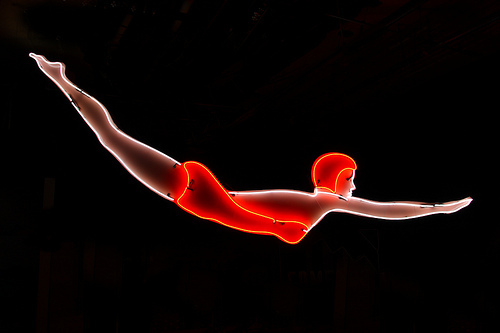 On Thursday MONA held a ceremony to light their rooftop replica of a neon diver that once hung above a roadside motel. The warm glow from this glass and gas revival is a welcome respite from the fluorescent world of 2014. Two photo exhibits pay homage to some of the gas giants of vintage neon: Sign Geeks opens July 12th at Space Gallery in Pomona and Sign Of The Times: California is up through July 10th at Perfect Exposure Gallery in Koreatown.